The position of Cuba in the world changed rapidly in the post-Cold War period. The demise of the Soviet Union and the end of its annual $5 billion subsidies caused grave economic problems and led to the economic crisis of 1989. The Cuban regime adjusted to the changed balance of power in the world by allowing small-scale reforms. Seeking a broader and secular role in helping their communities, churches opened a dialogue with the Cuban government in the 1990s. For the first time since 1959, a Cuban entity other than the government was now allowed to help address the social problems facing the Cuban people. The Cuban government had realized the need for faith-based organizations to provide social services to its population. Expectations ran high for the papal visit to Cuba in 1998. During this visit the pope asked the world to open up to Cuba, and Cuba to open up to the world. Castro did some minimal concessions to the Catholic Church but failed to keep his promises of a widening of the Church’s social competencies. Pope John-Paul’s visit solidified the role of faithbased organizations as independent institutions where people can go for help. These NGOs now seek the expertise and support necessary to strengthen their ability to deliver services and develop their independent role in identifying needs and distributing social services to the people of Cuba. Following the Pope’s visit, humanitarian and social services conducted by Cuban NGOs addresses the need for quality social welfare support to empower local non-governmental social service organizations (NGOs). The participating NGOs demonstrate the benefits of independent social service efforts by helping average citizens transform their personal hardships into better futures. In the process, these NGOs play a major role in the institutionalization of faithbased and secular social service organizations in Cuban society. The role of churches as a vehicle for the establishment of independent social services in Cuba in the 21st Century mimics the role they played in the United States during the 19th Century. It is a modern reminder of the universal role of faith-based NGOs as effective providers of social service programs. In addition, it serves as testimony to their resilience in the face of adversity. Humanitarian and social services conducted by Cuban NGOs seek positive social and health outcomes for the people of Cuba by providing the knowledge and expertise necessary to strengthen, expand, and, in some cases provide the impetus for establishment of non-governmental social service agencies. Humanitarian aid in the Special Period is generally given through the church rather than to the church. This puts the church in a good position of helping the country but without competing with government agencies. Humanitarian aid is thus a strategic and leveraging “tool” used to help the faith-based NGOs perform their religious mission, and their role of independent social service providers. The official state structures involved in the channeling of the humanitarian aid are bureaucratic and slow. A fast and efficient distribution is required, because the medicines and food donations tend to be close to the expiry dates when it is sent to Cuba. Several cases have been reported where medicines and food turned out to be useless once it reached the final destination. Some financial donations are made by foreign organizations and private persons to enable the faith based NGOs, such as Cáritas de Cuba (Catholic Charities of Cuba) to buy food and necessities in the (expensive) state shops. The majority of this type of aid enters the country through persons visiting Cuba (carrying goods in their luggage), by post and air cargo. Usually heavy taxes are imposed on these donations by Customs. Sometimes, part of the goods or all goods, are confiscated at the airport. The Cuban State justifies these measures by stating that the distribution of medicine is the sole responsibility of the state and that the church is not able to operate as a pharmacy. The various offices of Cáritas de Cuba and of Protestant Conventions conduct a whole range of social projects, among which the following are the most important: care for the elderly (humanitarian aid, laundry services and social clubs), working groups for handicapped children (down syndrome) and their parents, day care for children, help to single mothers, special classes for teenagers with learning problems, help to small independent farmers, and educational projects (such as computer and sewing lessons). The need for social services NGOs is certain, as is the need to train people to deliver these services. The institutionalization of Cuban NGOs in providing social services for the elder population and other segments of their population is worth supporting. The demographics of an aging Cuban population necessitates social services benefiting senior citizens, and faith-based NGOs have been unofficially delegated the responsibility of providing social services for the elder population, with the government preserving the right to assign individuals in need of service to the NGOs. In this context, the social activity of Cuban NGOs focusing on providing social services to the elder population is a strategic move. These NGOs are the strongest link in what will eventually become a chain of NGOs providing a broad array of health and human services. Faith-based NGOs currently conduct neighborhood humanitarian services, providing transportation, obtaining medical supplies, and providing meals. Church-affiliated social services are permitted to receive educational, financial, and material support from sister organizations in the United States. In return, the Cuban government demands that churchaffiliated NGOs on the island serve people without regard to their religious beliefs. But there are many problems. From year to year, the climate of openness and restrictions varies greatly. The rules keep changing. It takes wisdom and insight from God to adapt to these changing circumstances. In social projects of the faith-based institutions, the volunteers or representatives of an interest group or neighborhood take the initiative to start a new project. The ideas are thus developed at the grassroots level and later elaborated by staff. The volunteers themselves carry out the most important part of the projects and receive technical and social capacity building to do so. The fact that civilians have to organize themselves in order to manage a project and are being educated for this stimulates the civil and democratic consciousness and strengthens civil society as a whole. The initiatives of faith-based NGOs in Cuba provide the knowledge, expertise, and training, necessary to allow non-governmental organizations to function more effectively as independent social service providers in the future. NGOs that demonstrate their independence and establish their role as nonpolitical social service providers will be in a position to directly help the Cuban people through times of crisis. Strengthening Cuban social service NGOs will demonstrate the power of people and private charitable institutions working together, independent of government action. The faith-based NGOs take part in the build up of the Cuban civil society by creating civil structures and networks outside the government context. This civil society will probably play a principal role in Cuba after a future political transition. The Revolution greatly impacted the church (faithbased organizations). From the 1960s until 1990 discrimination against Christians slowed the growth of the church. Cuban Christians suffered under communism. In the early years some pastors were placed in “re-education camps,” a form of concentration camp. After a few years this phase of overt persecution ended, and phase of economic restrictions ensued. Christians, and their families, could not receive a good education or good jobs. This pushed Christians to the lowest levels of society. The situation gradually changed, but even in the mid-1980s declared Christians could still not hold jobs where they would influence other people, especially children. This means no Christian teachers, social workers, counselors, etc. The results of these economic restrictions was that very few people wanted to be associated with Christianity as it would lead to loss of job or status, as well as other types of discrimination. Another form of discrimination against the church was a restriction on meetings and building repairs. For twenty years, churches were not allowed to repair their facilities or build new ones. Religious activity was restricted to registered church buildings. As the old buildings were eaten by termites, and fell down through exposure to the elements, they could not be repaired or replaced. Since religious activities could take place only in existing registered buildings, as a building collapsed, a congregation was lost. In 1982, the government eased their restrictions and allowed the congregations permission to repair church buildings, and also started to issue new permits for buildings to conduct religious services. In 1998 the Cuban government gave permission for Evangelicals to hold joint open-air crusades. This resulted in several months of intense evangelistic activity, door-to-door evangelism, Christian concerts and culminating in nineteen open-air crusades in sports stadiums and plazas. Attendance at the crusades was huge, with the function in Havana gathering over 150,000. The mandate to serve all instills the most basic tenet of democratic values in developing NGOs on the island. It also places them in an excellent position to identify the needs of the population without political or theological filters. By establishing an NGO focus on helping everyone in need without discrimination, church-affiliated NGOs are in position to survive political change. The manuals and training will be made available to all faith-based NGOs providing social services in Cuba. • The Cuban government will not issue us D-8 Religious Visas for large groups of people to visit the Island as a part of a religious group. • Although the democratic dissident movement of Cuba counts many clergymen, religious persons and Christians among its members, the movement does not receive public support from church institutions or church authorities. • Repasos de las asignaturas de español, matemática e inglés y clases de computación en iglesias católicas. Se utilizan en esa labor, computadoras y otros equipos técnicos adquiridos en entidades comercializadoras, en el país, sin la debida autorización para la venta a esas instituciones. • Aumento gradual de adquisición de viviendas, usando el testamento, por instituciones religiosas, mediante el asentamiento, en casas particulares, de representantes de órdenes femeninas. • Atención a familiares de niños con síndrome de Down, aprovechando insuficiencias y falta de sistematicidad en la atención que deben dispensar las instituciones de Salud Pública. • Casos de médicos que, en ocasiones, ante la falta de medicina, sugieren o remiten a las iglesias los pacientes que acuden a las consultas de las unidades asistenciales de salud, con el fin de que en aquellas les suministren los medicamentos. • Atención material y recreativa, en algunas parroquias a adultos de la tercera edad, selectivamente. • Construcción de edificaciones para iglesias, casa pastoral o templos, sin la debida autorización del Registro de Asociaciones. The Economy Cuba is currently in the midst of severe economic problems. This situation has existed since the former Soviet Union fell apart. Prior to its demise, the Soviet Union had been giving Cuba billions of dollars per year in aid. In the late 1980s, aid amounted to seven billion dollars per year. In 1989, with the fall of the Soviet Union, this help ended overnight. The aid had been allowing Cubans to live a “communist dream,” when in reality the economy was in a shambles. Productivity in agriculture and industry was very low, but with the infusion of aid no one cared and probably very few even knew. The result of the loss of Soviet aid was that the standard of living plummeted for almost all Cubans. For several years Cubans had barely enough to keep them alive. In 1993, a limited free market system was introduced to Cuba. Its intent was to allow people to grow some vegetables in private garden plots, which they could sell to others. People could pay for a permit, which allowed them to open their sole-proprietor business and sell what they grew. To maintain their license, they paid a set fee each month plus a percentage of earnings as income tax. These businesses flourished and in 1995 the government allowed the free market to grow into other sectors of the economy. Free market businesses became very successful. They began to take over those sectors of the economy in which they operated. Few people went to a government owned business if there was a free market alternative. Private enterprise offered better service, quality and prices. Beginning in 1997, increasing government fees and taxes forced a large percentage of the new enterprises out of business. Today private sector businesses can be found in many areas of the economy. All are still sole proprietorships. They are allowed to employ only family members. Produce and foodstuffs are still available, but the biggest sector now caters to foreign tourists who use U.S. dollars to purchase souvenirs and other goods. The result is a growing class of entrepreneurs who have good incomes in U.S. dollars. There are others besides business people who have access to U.S. dollars. People who work in the tourist industry as waiters, taxi drivers, and maids in hotels all receive tips in dollars, making them among the highest paid people in Cuban society. A waiter who works in an expensive restaurant catering to foreign tourists may make as much in tips in a day as a Cuban doctor makes in a month! The influx of U.S. dollars means that not everyone in Cuba has a low standard of living. There are many people who have U.S. dollars, that they can spend on things unavailable to those who only have pesos. Throughout Cuba the government has opened special stores and entire shopping malls where almost anything can be purchased as long as the buyer makes his purchases with U.S. dollars. Cubans who have access to U.S. dollars can purchase anything from food to clothing, computers to television sets. Thus there are two economies in Cuba: the dollar economy and the peso economy. In the peso economy, most commodities are difficult or impossible to find. New clothing, soap, toothpaste, hygiene products and nearly everything else except the very basic necessities of life are scarce. In the dollar economy, almost anything is available. Cuban small business owners who deal with other Cubans and sell things in the peso market still have access to U.S. dollars. Cubans can legally exchange their pesos for U.S. dollars at government offices. At the present time the exchange rate is about 20 pesos per U.S. dollar. The rate is exactly the same as what one would receive on the black market. This funnels U.S. dollars to the Cuban government for use in buying petroleum and other commodities purchased on the international market. The hardship in eastern Cuba in some areas is so acute, that the government tends to bend the rules to help alleviate the problems. For example, prostitutes and foreign tourists negotiate with officers at the Office of Foreign Immigration so that the foreign tourist can spend the night at her home instead of going to a hotel, thereby allowing the prostitute to make extra hard currency for the room. It is hard to tell how eastern Cuba would react if there is a hardening of those flexible practices. The City of Santiago de Cuba is the second largest city in Cuba, population around 400,000. The city is surrounded by the country’s largest mountains, including Pico Turquino, Cuba’s highest peak (6,000 feet). The city is experiencing a continued draught. Water shortage is so acute that from March 2001 until the present, the government has requested that water only be use for cooking and drinking. Bathing should be limited to once per week. Water trucks control the distribution of water in most of the city. Water trucks make deliveries every five (5) days; you can take as much as you can carry. Water trucks often skip neighborhoods. Citizens must then wait ten days before the next delivery. Rainwater collected in cisterns becomes the only solution. Churches are assigned a number of senior citizens who can’t walk to carry their own water. Santiago is Cuba’s most Africanized city. The city is in very bad shape; most of the dwellings are literally falling apart. Poverty is very high as is unemployment. The need for help here is just overwhelming. At the Children’s Hospital, babies must have cotton earplugs at nights to avoid having cockroaches enter their ears. Thievery is such a large problem that to avoid breakins even chain link fences have surrounded gas stations. The conditions in the countryside east and north of Santiago are even worse. Water is not potable. Poverty is similar to what can be seen in Managua and Port au Prince. The government does not seem to be as “caring” in the eastern provinces as they are in the west. The main roads are paved (with multiple holes, like Swiss cheese) and the side roads are mostly dirt roads. When it rain, they get very muddy so if you are going into the mountains, it is better to travel by Jeep, horse or mule. The conditions are prime for the growth and distribution of diseases. Since the economic crisis in Cuba in 1989, the social situation in the country deteriorated dramatically. The counterproductive planned economy has caused a serious shortage of basic products. The shelves in state-run pesos shops are often empty and the products in the dollar-shops are beyond the reach of the average Cuban. Many Cubans complain that while the canasta básica (ration book for basic food supply) contains less food than ever and the prices have increased dramatically, the salaries of the Cuban worker stayed at the same low level (the usual salary is between 100 and 500 Cuban pesos monthly). The health system, once the showpiece of the Cuban regime, is a present not even capable of rendering the basis services. Medical consultations are still free, but there is a serious shortage of medicines to be paid in Cuban pesos and basic medical provisions (such as water, hygienic material and nutritious food) in medical and social institutions. Many Cubans find it a gross injustice that the state-run dollar pharmacies sell a wide range of medicines that are not accessible to them. They are often even denied access to the dollar-pharmacies. Meanwhile, the Cuban State is exporting national medicines to Latin-American countries and owns special well-equipped high tech hospitals for foreigners and the communist elite. Serious initiatives of civilians to improve their personal or communal situation are not appreciated by the state and almost always forbidden. For instance, a neighborhood council wanted to organize the garbage collection because the garbage is usually rotting in the streets for weeks, an often is a source of infections. The various petitions of the neighborhood council were rejected because garbage collection is considered the responsibility of the state. Cuban state institutions not only fail to render many social services, they also refrain others from doing so—Ni comen ni dejan comer; they don’t eat and they keep others from eating. Present System Some financial donations are made by foreign organizations and private persons to enable the faithbased NGOs, such as Cáritas de Cuba (Catholic Charities of Cuba) to buy food and necessities in the (expensive) state shops. The majority of this type of aid enters the country through persons visiting Cuba (carrying goods in their luggage), by post and air cargo. Usually heavy taxes are imposed on these donations by Customs. Sometimes, part of the goods or all goods, are confiscated at the airport. The Cuban State justifies these measures by stating that the distribution of medicine is the sole responsibility of the state and that the church is not able to operate as a pharmacy. Donations of goods directly made to the Cuban State without sufficient external monitoring have given cause for serious complaints regarding the reliability of the state channels. Several examples of appropriation of public funds and illegitimate distribution of humanitarian aid reported. For example, a French NGO donated a large quantity of tooth paste to be distributed among poor Cubans. It eventually ended up in the state-run “shoppings” that charge high dollar prices. It has been reported that some NGOs no longer wish to cooperate with the Cuban state in this way, because they could not account for these losses in their financial reports. The official state structures involved in the channeling of the humanitarian aid are bureaucratic and slow. A fast and efficient distribution is required, because the medicines and food donations tend to be close to the expiration dates when it is sent to Cuba. Several cases have been reported where medicines and food turned out to be useless once it reached the final destination. Currently, both Catholics and Protestants are using donated medicines as a strategic tool to gain religious and social service freedoms from the government, in exchange for full donations of medicines to the government. 1. An effort could be made to encourage existing Cuban-American charities that will likely wish to participate in an emergency response, to become members of InterAction, the NGO trade association, and to become registered with the U.S. Agency for International Development (USAID), and learn USAID grant-making process and InterAction governance and programming standards. Some of these charities, particularly those without field experience might also be encouraged to begin collaborative programming efforts with established NGOs in Central America or Caribbean countries as a means for learning the realities of field operations. 2. Terms and conditions could be developed now for four tracking systems—two in food and two in public health. These include nutritional surveys of children under five, morbidity and mortality tracking, food market surveys of prices, and household surveys of family food stocks. Data from these surveys are crucial in predicting crisis before they occur, determining whether aid programs are reaching the needy population, and where aid should be targeted. 3. Should the food security system in Cuba deteriorate and malnutrition rates rise, children under five will be particularly at-risk. A plan should be developed for the immediate immunization of all children under five for the major childhood diseases who have not been already immunized under the existing health system. The reported high level of immunization coverage in Cuba should be surveyed, as the quality control in the production of these immunizations may be weak if other eastern bloc countries are good predictor. This will reduce the mortality rates among children under five who are always the most vulnerable in food emergency. Given the existence of a welldeveloped primary and secondary school system, these institutions could be used to provide the nutritional supplements to children to maintain an adequate diet until the new government can create its own public health system. 4. If other communist societies are any measure of what will happen in Cuba, the Church will grow rapidly across the country during the transition. These Church structures could be used through their Church-NGO counterparts as mechanisms for the provision of humanitarian assistance if careful accountability systems are set up to ensure proper training of need and control over relief commodities. While official U.S. government funding cannot and should not be used to build or support churches, these grassroots institutions in fact can be a stabilizing force during the stresses of transition and an important force in longer-term development of civil society to guard against the return of totalitarianism. Ten years ago, Cáritas de Cuba started working in some Cuban cities and since then has developed strong structures and networks. It was only four years ago that Cáritas entered the more rural provinces of Cuba, and consequently the structures and projects of these offices are still relatively weak. Nowadays, the Cáritas staff consists of 30 persons, while the NGO built up a network of at least 8000 volunteers. All offices of Cáritas prefer financial donations to material goods, because of the restrictions imposed on them by the government regarding the distribution of goods. Also, Cáritas prefers to mobilize the (experienced and often professional) volunteers for their social projects instead of calling on them as monitors. The various offices of Cáritas de Cuba conduct a whole range of social projects, among which the following are the most important: care for the elderly (humanitarian aid, laundry services and social clubs), working groups for handicapped children (down syndrome) and their parents, day care for children, help to single mothers, special classes for teenagers with learning problems, help to small independent farmers, and educational projects (such as computer and sewing lessons). The Catholics also conduct all kinds of social projects, such as childcare projects, working groups for alcoholics, projects for aged persons etc., etc. The government has also allowed some Catholic leaders to manage a few hospitals in Havana. La Iglesia Católica ha incrementado sus publicaciones, con altas tiradas de ejemplares y realiza una notable labor con la intención de promover a laicos a cargos de responsabilidad en instituciones estatales, en particular en las educacionales y, culturales, con mayor énfasis en el sector de la salud. On the eve of the Revolution, the Protestant churches were fairly marginal, due to small numbers, a relatively brief presence, and division into numerous denominations. During the subsequent decades, the government obtained the cooperation of certain Protestant leaders who were the first to accept the regime and during this period, increasingly supported the Revolution. Church leaders shared the social goals of many of the Revolution’s programs and generally downplayed limitations placed on believers as individuals. Leaders of some of the largest Protestant conventions, such as the Baptists of the western and eastern Cuba, and the Assemblies of God, were more reluctant to cooperate and never joined the government umbrella Protestant organization now called the Cuban Council of Churches. 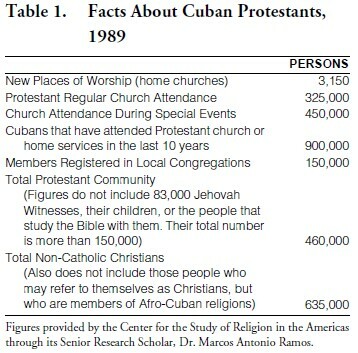 In the most recent study of Cuban Protestants, conducted in 1989 by the Center for the Study of Religion in the Americas (see Table 1), it was estimated that 635,000 Cubans were considered to be non- Catholic Christians. Interviews with Cuban pastors revealed the existence of 880 licensed churches, 3,150 house churches, 2,100 pastors, and eight seminaries. 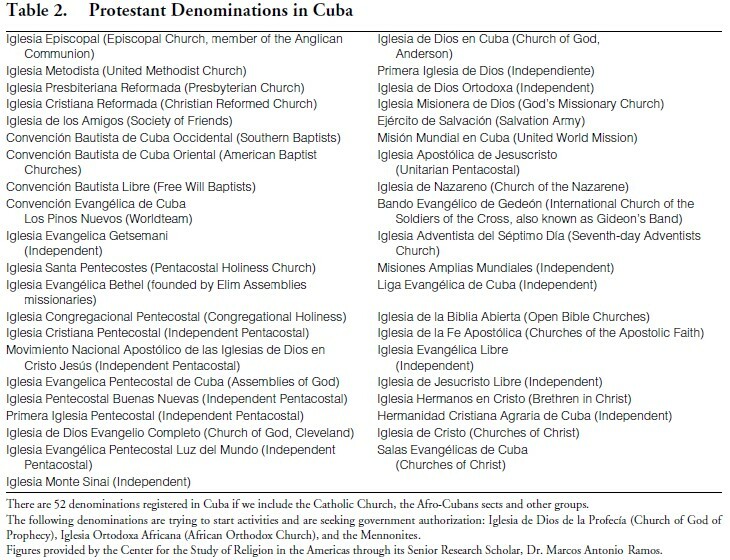 The existence of 47 Protestant denominations (see Table 2) makes it difficult to arrive at a common social service strategy for all Protestants in Cuba. This is further complicated by the membership of only 27 denominations in the pro-government Council of Churches. Christians in Cuba vary politically. They generally hold one of three positions towards the government. • There are the liberal Christians who wholeheartedly support the Cuban government. Liberal Christians are now a very small minority in Cuba and are losing their influence on Cuban society. Most Liberal Christians belong to the Cuban Council of Churches, Consejo de Iglesias de Cuba. • There are anti-government, often charismatic “Pentecostal” Christians, who take a strong position against the government as being anti-Christ. These groups encourage the smuggling of bibles and disobedience of government regulations. • The third position is more middle-of-the-road. These denominations pray for the government and try to live and work within the bounds of current laws. They seek to enlarge their influence and freedoms by a Christian life style that sets them out as ideal Cuban citizens. They seek to gain permissions and create a new climate of trust and dialogue without compromising their integrity and autonomy. 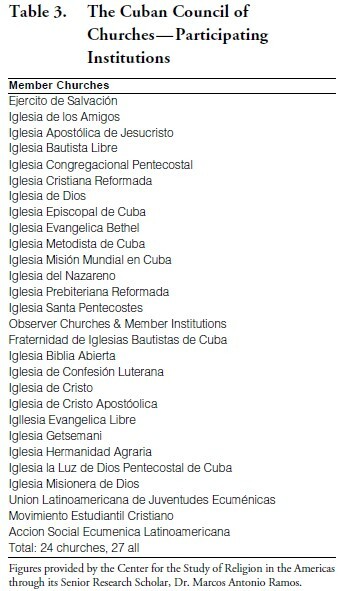 The Cuban Council of Churches, Consejo de Iglesias de Cuba, is a Protestant umbrella organization made up of 24 of the 52 licensed Protestant denominations in Cuba (see Table 3). Council leaders share the social goals of many of the Revolution’s programs. The Council also operates a Theological Seminary in Matanzas, which eventually developed a full theology in support of the Revolution. • Is authorized to broadcast a radio program. • Authorizes all religious literature. • Has virtual veto power on all religious activities. The Council has been known to effectively “blackball” foreign organizations from shipping humanitarian aid, and in some cases, it has prohibited organizations from working with U.S.-based religious organizations that they deem unacceptable. Las organizaciones religiosas en la Capital han ampliado su capacidad de actuación en la sociedad; realizan proselitismo directo, algunas emplean el método de visitar los hogares, y otras prácticas novedosas con el fin último, de captar nuevos adeptos. Esas instituciones que reciben respeto de la sociedad y tienen el reconocimiento oficial, han participado en proyectos sociales con el apoyo de fundaciones y organizaciones no-gubernamentales, extranjeras en ocasiones con la debida auto-sanción y en otras sin ella. Asimismo, las iglesias cristianas han incursionado en actividades de asistencia social con carácter caritativo. La Iglesia protestante restablece las posiciones teóricas y ecuménica. El Consejo de Iglesias de Cuba, con sede en la Ciudad, continua manifestando actitudes políticas positivas de las iglesias que lo integran, y labora para incorporar nuevas instituciones. At any time there is a strong likelihood that some faith-based NGOs will face harassment and some will be forced to curtail or cease operation. However, the demographics of an aging Cuban population necessitates social services benefiting senior citizens, and faith-based NGOs have been unofficially delegated the responsibility of providing social services for the elder population, with the government preserving the right to assign individuals in need of service to the NGOs. In this context, the social activity of Cuban NGOs focus on providing social services to the elder population is a strategic move. These NGOs are the strongest link in what will eventually become a chain of NGOs providing a broad array of health and human services. The Cuban faith-based NGOs recognize the uncertainties of dealing with economics and politics. Even in the unlikely circumstance that all existing NGOs were closed; the present activities ensure viability by providing the basis for redeveloping social services at a future date. Faith-based leaders will continue to observe health and human needs and services available to people in Cuba, the arrival of new émigrés would continue, and humanitarian organizations will still need to be prepared to help people in Cuba when the opportunity develops. 1. Competition with the state: The Cuban state seems to consider the social projects of non-state organizations as a form of competition that has to be restricted. Although the social projects provided by Faith-Based NGOs help to supply the needs of the Cuban community and rectify some of the deficiencies created by the state, the projects meet with strong opposition. This “internal blockade” is experienced as more damaging for the social services in Cuba than the U.S.- imposed embargo. Sometimes the non-state social projects stimulate the state to improve social facilities. For example, once the project of Cáritas regarding children with Down syndrome turned out to be successful, these children were suddenly accepted in state-run childcare institutions. The state also started some comedores (eating facilities) for elderly people because of the success of similar projects initiated by Cáritas. 2. Limitation on facilities: The Catholic Church, Cáritas, or any Protestant group not affiliated with the Cuban Council of Churches is allowed to rent buildings to execute their projects. They fully depend on private persons that place their houses at the disposal of the project. But even then, they often have problems. A nun who managed a child-care project in the house of a private person (without payment) was accused of renting illegally and the owner was accused of working for her own account (cuenta propia). The child-care project is now situated in a corner of the church building. 3. Restricted education: The state does not allow components dealing with social development or education in the social projects, since these subjects are considered the sole domain of the state. This means that most projects, sooner or later, get into trouble since capacity building is often included in the projects. The local offices of Cáritas were very disappointed that some European NGOs, such as Caritas Germany, decreased their financial support, arguing that they preferred (large-scale) development projects to charity (“providing alms”). But within the Cuban context, development projects can only be carried out to a certain extent. In view of the above, it can be seen as an interesting development that the EU recently decided to finance a project for elderly people that will be carried out directly by Cáritas. Many interviewees saw it as a sort of test case for Cáritas to explore the range of its action. 4. Government harassment: The volunteers, clergymen and nuns working in social projects are often harassed, dismissed and even arrested by the state. Dagoberto Valdés is director of the Catholic magazine Vitral, which won the prestigious “Prince Claus Award” in Holland and of the Centre for Civil and Religious Education (Centro de Formación Cívica y Religiosa) in Pinar del Río. The state institutions try to obstruct him as much as possible and take measures against him as to paralyze his work. Recently he was transferred to the countryside where he is forced to do unskilled labor. Other, often less well known, volunteers were sentenced for their activities by formal dismissal of their jobs. Foreign clergymen and foreign nuns, who live under the constant threat of expulsion and deportation to their home country by the Cuban government, often manage the social projects of the Catholic Church. This makes the social work of the Catholic Church vulnerable. 5. Limited long-term visas: Visas for foreign religious workers are restricted. Except for a few foreign Catholic clergymen and nuns, who were granted long-term visas following the Pope’s visit. Virtually no long-term visas are issued to foreign religious workers. Often, the most vulnerable segments of the population suffer disproportionately. Especially in times of crisis, caring for the hungry, elders, those with disabilities, the sick, and the dying, take a back seat to more dynamic forces in society. These social service initiatives strive to change these dynamics by allowing faith-based NGOs to attain a position of leadership in the provision of social services to the Cuban population independent of political situations. Faith-Based Social Service Initiatives meet their mission by empowering NGOs to provide quality care and assistance to increasing numbers of people. They strive to help NGOs become essential and indispensable providers of care. As a result, those normally pushed aside during crisis will become the first beneficiaries of independent action and change. Developing strong bonds between NGO providers and the most vulnerable segments of the population will provide the catalyst for improving the health and social welfare of all people. In social projects of the faith-based NGOs, the volunteers or representatives of an interest group or neighborhood take the initiative to start a new project. The ideas are thus developed at grassroots level and later elaborated by staff. The volunteers themselves carry out the most important part of the projects and receive technical and social capacity building to do so. The fact that civilians have to organize themselves in order to manage a project and are being educated for this stimulates the civil and democratic consciousness and strengthens civil society as a whole. Los ancianos que asisten a los hogares, reciben buena atención. Los hogares mantienen adecuada organización, buen servicio y condiciones higiénico, sanitarias y ambientales acogedoras, de manera que los ancianos manifiestan plena satisfacción con la atención que se les brinda. • Personal attention and human warmth are vital in non-governmental projects. The human being is at the center stage while in state institutions the services are usually rendered in a more “mechanical” manner. Therefore, the child-care and the projects for elderly persons and handicapped children run by the Catholic and the Protestant Church are well liked by both participants and family members. • The success of social projects of non-governmental organizations sometimes encourages the governmental institutions to carry through small improvements in their organizations. This section of the paper presents the concerns of the Cuban Government with respect to religious organizations and Faith-Based NGOs. It is based on the document titled “Acerca del Análisis Político del Fenómeno Religioso en la Capital,” issued in April 2001. Se evidencia que Instituciones Religiosas, para reforzar su labor proselitista, tratan de ocupar un papel protagónico en la solución de determinadas necesidades a individuos y grupos específicos y reducidos de personas, e incursionan, con ese propósito, en actividades que forman parte de las conquistas de la Revolución para beneficio masivo de diversos sectores de la población, en cuyo aseguramiento y sostén están empeñados el Estado Cubano, el Gobierno de la Ciudad y las Direcciones Administrativas de subordinación Provincial. Las referidas actividades, distanciadas de los diversos cultos y de las practicas religiosas, las han realizado representantes de esas instituciones, según se ha valorado, violando, en ocasiones, leyes o regulaciones aprovechando, al parecer, fallas administrativas causadas por lentitud, pasividad o falta de vigilancia para hacer cumplir lo establecido. La Dirección Provincial de Justicia ha procedido a realizar las advertencias, hasta en tres oportunidades, al conocer de la existencia de casas culto no legalizadas, pertenecientes a denominaciones reconocidas, pero continuaron funcionando. Entre 1999 y el presente año, funcionarios del Registro Provincial de Asociaciones, se han entrevistado con líderes religiosos para llamar su atención por el funcionamiento de casas culto en varios Municipios. Aunque es fluctuante la cantidad de viviendas dedicadas a esa modalidad, se conoce de la existencia de 220, localizadas en todos los municipios, con la excepción de Plaza de la Revolución. En el registro de asociaciones, se han atendido a representantes de congregaciones no reconocidas legalmente, a quienes se les ha llamado la atención al respecto; en esa situación se encuentran las siguientes. • Congregación Cristiana, procedente de Brasil. Recibe donaciones; las mujeres son misioneras no pueden ser pastores; se sustenta con la ofrenda voluntaria, aunque todos tienen que trabajar. Es una agrupación familiar. • Iglesia Alianza Cristiana Misionera. Su trabajo es con los niños, hacen bailes de disfraces, fiestas de cumpleaños, etc. • Sociedad Espiritistas en Oriente “Nana Merced.” Es un desprendimiento de otra que existió entre los años 37 al 44 en Oriente, la que se trasladó para Ciudad de La Habana. La Academia de Ciencias mantiene relaciones con ellos, a propósito de investigaciones. • Fraternidad Internacional de Hombres de Negocios del Evangelio Completo en Cuba. Agrupa a hombres de diferentes denominaciones que se reúnen para compartir testimonios. Participan en comidas y eventos en locales públicos y en casas particulares. Es una agrupación Internacional con sede en Estados Unidos; hay 8 grupos formados. Las mujeres son acompañantes fraternas, los viajes al exterior los hacen por invitaciones que reciben. • Grupo de Música Tradicional Cubana Wantú son. La Iglesia Episcopal lo apoyó inicialmente y dejo de hacerlo cuando apreciaron que el interés de sus integrantes, al parecer, consistía en crear una nueva congregación religiosa y esa agrupación podía ser el embrión. Lo integran personas mayores que mezclan baile y culto afrocubano y escultura; se dice que se reúnen en un local de la Oficina del Historiador, en Obrapía #556 entre Monserrate y Bermaza. • Religión Musulmana. Su filosofía es el Islam, basada en el Corán. El líder imparte conferencias en embajadas y la Casa del Árabe, tienen interés en crear una mezquita y manifestó poseer otros lugares en la Ciudad. • Iglesias Quadrangular. Esta denominación existió entre 1947 y 1967, año en el cual su Presidente, norteamericano, abandonó el país. Antes de su salida, una de sus misioneras ocupó la casa pastoral; pasado un tiempo el Templo fue cerrado, y entregado el local a una Zona de los CDR. En ese lugar intentaron levantar un Templo, pero el Gobierno Municipal no lo permitió; no obstante se encuentran activos en Arroyo Naranjo, Palma Soriano y Las Tunas, este caso ha sido atendido por el Viceministro de Justicia y sus representantes se relacionan con el Reverendo Raúl Suárez. • ILE-TUN-TUN. Aunque muchos de sus integrantes son miembros de la Asociación Cultural Yoruba de Cuba quieren separarse de la misma. El líder ha manifestando que ellos defienden la verdad cultural, quieren rescatar las tradiciones y raíces. Están apoyados por un nigeriano, que depositó dinero para construir un Templo. • Espirita Ramaís de Cuba. Al grupo promotor, se les explicó la ilegalidad y se reorientó, ya que sus objetivos y fines coincidían con otras legalizadas. • Iglesia Evangélica Luterana de Cuba. Esta denominación esta divida, una rama es Iglesia Evangélica de la Confesión Luterana. La segunda rama. La Iglesia Evangélica Luterana de Cuba, se encontraba en calle 60 y 7ma. Playa, donde actualmente está la sede de la Dirección Municipal de Cultura. Según las informaciones de su líder, tiene casa culto en Miramar, Vedado, Lawton y San Miguel del Padrón, y está reclamando su reconocimiento, negando la otra que fue formada en 1989, También tiene misiones en otras provincias del país, donde realiza donaciones de medicamentos y otros productos. • Iglesia Morava. Su origen es polaco, aunque la iglesia madre se encuentra en Jamaica; sus dirigentes han pertenecido a otras denominaciones. El llamado Presidente está pasando la escuela de teología en la iglesia Episcopal. Las sedes principales se encuentran indistintamente, en La Habana Vieja y en Diez de Octubre. Se apoyan en la teología de la liberación. • La denominada Alfa Omega. Sus casas se encuentran en La Lisa y en Diez de Octubre; les fue notificada a los titulares de las viviendas, sus ilegalidades, por los representantes municipales de Justicia, en esos territorios. Se valora como contraria a la Revolución. En la provincia existen otras iglesias que actualmente no pertenecen a ninguna denominación reconocida legalmente, pero que en algún momento si lo estuvieron: Fraternidad de Iglesias Bautistas de Cuba; pudiendo mencionarse a la Jordán, ubicada en el reparto Mañana, Municipio de Guanabacoa; otra es la iglesia de Dios “Cristo Rey,” ubicada en La Lisa. Más adelante, en la quinta Disposición, establece que el registro de Asociaciones actuará acorde a lo preceptuado en el artículo de la mencionada ley; el que establece la disposición de sanciones administrativas. Tanto La Ley de Cultos, como lo relacionado con las sanciones administrativas aun no han sido aprobadas, por lo tanto la labor de las direcciones de Justicia, se limitan a explicar, reorientar a los representantes de esas congregaciones. En los casos más significativos es la Fiscalía, en los Municipios, quien hace la notificación y puede procesar a los implicados por asociación ilícita. a. Controlar la dispensación de medicamentos por parte de los médicos. Ajustando la prescripción al cuadro básico de productos farmacológicos existentes. Orientar a los médicos sobre la existencia de medicamentos y los plazos de abastecimiento. Divulgar a través de los fármaco-epidemiólogos las posibilidades terapéuticas en razón de las existencias y el empleo de la medicina natural y tradicional. b. Supervisar a través de las Farmacias Principales Municipales la distribución de medicamentos en la red de farmacias. Realizar control de la distribución efectuada. Supervisar la venta de medicamentos a nivel del mostrador de farmacias. c. Exigir a través de los fármaco-epidemiólogos existentes en los territorios, la Política orientada en el campo de los medicamentos. Realizar fármaco- divulgación en las unidades asistenciales. Informar a los directivos en cada uno de los niveles asistenciales la situación relacionada con los medicamentos. d. Sancionar de modo severo las ventas ilícitas de medicamentos y el desvío de los mismos. Establecer mecanismos de detección de ventas ilícitas de medicamentos y proceder a su eliminación mediante las autoridades competentes. Realizar control exhaustivo en la cadena de produccióndistribución- comercialización de medicamentos, para así evitar posibles robos o malversaciones. e. Elevar la exigencia en las inspecciones sanitarias a las viviendas que se dedican al cuidado de niños. Controlar lo relacionado con el estado constructivo del inmueble y las condiciones higiénicas sanitarias. Observar de modo particular todo lo relacionado con el almacenamiento, confección y expendio de alimentos. f. Actuar de manera enérgica, en conjunción con las direcciones de Trabajo y Segundad Social y. educación, en los casos que se detecten viviendas sin la debida Licencia, que autoriza el cuidado de los niños. Controlar a través de los Consultorios Médicos de la Familia las viviendas destinadas a estas actividades. g. Detectar las viviendas dedicadas de modo ilegal al cuidado de los ancianos y prohibir su funcionamiento. Orientar la prohibición de esta modalidad en viviendas privadas. Suspender ese servicio en las viviendas detectadas. h. Tomar medidas que delimiten el suministro de insumos a las Instituciones Religiosas, por cuanto estos aseguramientos deben garantizar el funcionamiento de las instituciones estatales. Cumplir los compromisos asumidos con las instituciones acordadas. No promover la entrega de recursos priorizados a instituciones no contempladas dentro del marco de prioridad. a. Aumentar las atenciones a los alcohólicos crónicos en las áreas de salud. Efectuar acciones a favor de la atención al alcohólico crónico y su familia. b. Prevenir el alcoholismo, sobre todo en los jóvenes, realizando campañas de divulgación y restringiendo la venta y comercialización de bebidas alcohólicas. Combatir los hábitos alcohólicos en los jóvenes a través de los círculos de adolescentes, el trabajo comunitario y la persuasión directa en casos específicos. Coordinar y restringir el expendio de bebidas alcohólicas en cada uno de los territorios. c. Ampliar los servicios y cuidados a los pacientes con síndrome de Dawn, regionalizando la atención a los mismos. Brindar atención médica especializada a los pacientes aquejados de este síndrome en su área de salud. Apoyar psicológicamente a los familiares de estos pacientes. d. Aumentar, en coordinación con la Dirección de Trabajo y Seguridad Social, la atención al adulto mayor especialmente al anciano que vive solo. Realizar atención médica preferencial al anciano solo, priorizado por el medico de la familia. Garantizar los aspectos higiénicos, de alimentación, vestuario, a través de la coordinación con la Dirección de Trabajo y Seguridad Social. e. Mejorar la atención al adulto mayor en los Hogares de Ancianos y las Casas y Círculos de Abuelos, solucionando problemas materiales y de ampliación en las ofertas de servicios. Solucionar los aspectos constructivos y de avituallamiento en cada uno de los hogares de Ancianos, Casas y Círculos de Abuelos. Gestionar con los Gobiernos Locales y otras entidades, nuevos servicios que aumenten la calidad de vida del adulto mayor. Detectar y proceder con todo rigor, conforme la ley en los casos que se detecten construcciones ilegales, mediante el proceso continuo de Control Urbano. 1. “Acerca del Análisis Político del Fenómeno Religioso en la Capital,” Abril 2001, formado por los responsables Directores Provinc iales, Secretaría del CAP. 3. “Acerca del Análisis Político del Fenómeno Religioso en la Capital,” Abril 2001, formado por los responsables Directores Provinc iales, Secretaría del CAP. 4. “Acerca del Análisis Político del Fenómeno Religioso en la Capital,” Abril 2001, formado por los responsables Directores Provinc iales, Secretaría del CAP. 5. “Acerca del Análisis Político del Fenómeno Religioso en la Capital,” Abril 2001, formado por los responsables Directores Provinc iales, Secretaría del CAP.